How to access MetaData Of a class using Java? 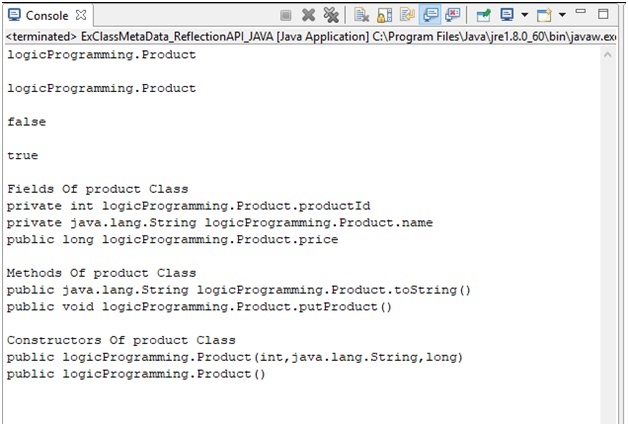 In this article, we are going to learn that how can we access metadata of a class using java? MetaData of a class includes the class name, fields name, methods, constructor etc. To get the MetaData, we use Java reflection API. Java refractor class provides the methods to get the metadata of a class. Here, we are going to use the following methods. This method loads a class which is provided as the parameter , if class is not found it will throw an error. This function checks whether a class is an interface or not and returns a Boolean value. This returns all fields name of a class. This returns all methods name of a class. This returns all constructor name of a class. Let’s understand them more clearly by this example. Here, we have a class name Product with three fields in it and an interface named NoteBook. //returns an array of name of all fields of this class. //returns an array of name of all methods of this class. //returns the total number of constructors of this class. Here, we have all the meta data of the class.